While globalization has witnessed the decline of U.S. dominance in manufacturing, energy and even finance, one thing had long been presumed unassailable: Good old American ingenuity. Now it appears that’s not safe, either. China, whose industries have been envied in the West more for their tenacity than their ingenuity, has established a multi-year framework to become more innovative and, therefore, competitive. So has Singapore. Finland is merging its top business school, design school and technology school to create a multi-disciplinary “university of innovation” next year. The wild card these days is what will happen to innovation — the advance of progressive ideas in science, technology and business — now that the world economy is in a tailspin. The conventional wisdom might suggest that business, government and academia will be less willing to embrace the risk-taking and short-term costs that come with the territory of innovating. He also cautions against too much caution — over-reliance on incremental innovation versus transformative, or “disruptive,” innovation. In innovation circles, the two have come to be differentiated as “little i” and “Big I” innovation. “The largest gains in business come from more daring innovations that challenge the paradigm and the organization,” Schoemaker says. While “disruptive innovation” has enjoyed office buzz-phrase status for only about a decade, the idea is quite old: Austrian economist Joseph Schumpeter had it in mind when he borrowed the phrase “creative destruction” to describe his theories of how entrepreneurs sustain the capitalist system. So just how does an entrepreneur or business go about being “disruptive?” How does one convince investors or top brass of a radical idea’s worth? One person who knows something about bringing disruptive innovations to market is Jeong Kim, president of Bell Labs at Alcatel-Lucent and a successful tech entrepreneur. He offered some suggestions in a recent presentation titled, “Paving the Way for Disruptive Innovation,” that was part of the Executive Master’s in Technology Management (EMTM) program’s ongoing lecture series: Aligning Emerging Technology and Business. That point gives rise to the question: What is the best business model for fostering innovation? As it turns out, numerous decision-making tools exist to help firms systematically manage an innovation program, says Schoemaker, co-author of a book titled, Wharton on Managing Emerging Technologies. A prime example she has found in her own research, she noted, is Verizon Communications, the giant telecommunications firm. Stock analysts questioned Verizon’s large capital outlays on FiOS, a high-volume fiber-optic network intended to counter a “triple-play” threat to its business posed by Comcast’s cable television, high-speed Internet and voice-over-Internet phone service. That points to a “big trend” emerging in product development, so called “Open Innovation,” according to Wharton marketing professor George S. Day, co-director of the Mack Center for Technological Innovation and co-author of Wharton on Managing Emerging Technologies. Open Innovation, also known as “crowdsourcing,” entails collaborating with partners to solve business problems. The archetype of that model is Waltham, Mass.-based InnoCentive. It matches corporate “seekers” who have science, engineering and business problems with amateur “solvers” worldwide. The “solvers” then compete — for bragging rights and often token rewards — to provide the best answers to the corporate problems. “Most companies are not looking for a big innovation they can knock out of the ballpark,” Day says. 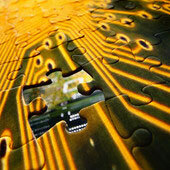 Rather, they want a relatively quick fix for a specific piece of a larger puzzle. For firms that want the “secret sauce” to always come from in-house, previous success can present a huge roadblock to innovation, according to Kim. The problem is that success creates a virtual construct, a paradigm of “How to Do Things,” inside of which new thinking cannot flourish. Kim calls it “The Curse of Knowledge.” Cross-discipline teaming “is one way of breaking the Curse of Knowledge,” he says. Another is “experience pairing,” or matching a senior employee with an individual who has considerably less experience, but a fresh perspective on how to solve problems. An incredible opportunity to innovate disruptively lies in the problem of information overload, says Kim. Knowledge is being created at a far faster rate than any one human can ever hope to assimilate. The flip side is that we constantly filter out vast stores of data because we are bombarded with information like never before in history. The term “disruptive technology” went viral in the late 1990s after the release of Harvard Business School professor Clayton Christensen’s book, The Innovator’s Dilemma. But in practice, Bell Laboratories has served as an incubator of paradigm-shifting, “disruptive” innovations since its creation in 1925 as a joint venture of AT&T and Western Electric. Researchers at northern New Jersey-based Bell Labs have won six Nobel Prizes and take credit for an inventory of innovations: The photovoltaic cell, the silicon-based transistor, statistical process control, the UNIX operating system, the C programming language, digital cell phone technology and wireless local area networks are just a few of the better-recognized innovations that have taken shape there. Kim offered a case study from Alcatel-Lucent — Lucent Technologies at the time — on how to inject a spirit of disruptive innovation into an existing and stagnant culture. Lucent’s optical networking division was severely underperforming and the company fired the unit’s top managers. “I was really convinced that the reason I was put in there was that nobody else would do it, and they needed somebody to blame,” says Kim. But the exercise-psychology experiment wasn’t over at the end of the rafting run. “After six or seven hours of whitewater rafting like this, they were tired.” That evening over dinner, people let their “at-work” guardedness down and spent time learning about one another. Kim’s advice for jumpstarting disruptive innovation is not exactly revolutionary, though it can seem exceedingly rare when many companies still think quarter-to-quarter and employees take a similarly short-ranged view. Basic research investigates the most fundamental of scientific questions and has no direct commercial application. At the same time, it has laid the groundwork for most of the modern technological conveniences we enjoy today, including commercial aviation, the GPS system and lasers.